Try the parts of our MetaTrader 4 Setup designed to help you trade within safer limits with discipline with an unlimited FREE licence. Then upgrade to the PRO version for a full-set of automated indicators, alerts and strategy formation tools. Designed to help keep your money safe and trading disciplined. Automatically calculating and showing you to the information every trader should be aware of in their trading plan. This quick setup will give you the essential elements for your optimising your MetaTrader installation. 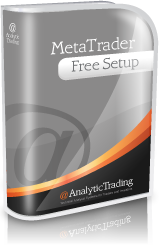 To download the MetaTrader FREE Setup version just add it to your shopping basket, and then checkout. You will need to register with the website so that we can send you a serial number and updates but you will not need to make any payment or provide any payment details. Developed to help you find profitable trade setups. 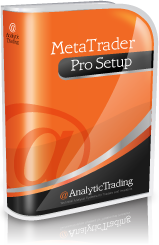 The MetaTrader Pro Setup is for automating signal analysis and setting alerts for the best price-action trade setups 24/7.